These are the requirements for those dedicated few: the VPs of Ops and Directors of Facilities responsible for keeping a nation-wide portfolio of sites comfortable, so that the cash registers keep ringing during brutally cold winters and long hot summers. Cue the trumpets: Welcome to the Polar Vortex Olympics. Of course cold weather is no joke when human life is endangered, but medaling at the Olympics takes some of the same qualities you need to keep your customers comfortable with smart facilities management during extreme weather events. For someone managing facilities from the Gulf Coast to the Great Lakes, preparation is important – from ongoing execution of standard preventive maintenance to finding and securing a network of good service providers and more. In addition to these basics, being prepared for extreme weather also means remote control of your HVAC fleet. This would have been prohibitively expensive 5 or 10 years ago, but the substantial drop in cost (and expansion in capabilities) of cloud-based heating and cooling control puts this level of preparation well within reach. Remote control, if coupled with sufficiently flexible software, allows for enterprise-wide changes to be made in advance of or during extreme weather, ensuring customer comfort. In the midst of a severe weather event, many locations will be reporting problems. In order to efficiently address all of the complaints flooding in, the medal winner must have the right equipment. Real-time visibility into key performance indicators is now possible for common roof-top heating and cooling units (RTUs). Available data include thermostat set points, room temperatures, RTU electrical usage and, in some cases, supply and/or return duct temperatures. These data types help the fleet manager separate the inbound complaints into two categories: thermostat program issues and equipment performance issues. The chart below shows an example of an equipment performance issue we discovered recently. 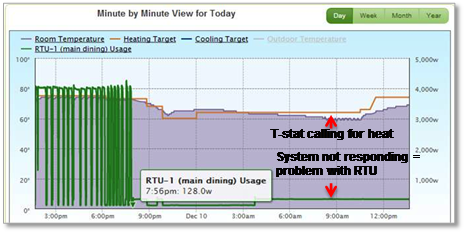 In this case, the thermostat set point of 68 degrees is correct, but the lack of appropriate electrical usage (the green lines) reveals that the fan is not running on this unit while it is is calling for heat. No changes to the thermostat are going to solve this – only a visit from the HVAC tech, armed with this key information, will earn the gold. The Winter Olympics are only held every four years, and in many cases, extreme weather events like the recent Polar Vortex are similarly infrequent. This means that many months, or even most years, will pass without a glaring moment of truth. It therefore requires dedication to best practices and an investment of time and money to be ready for unexpected severe weather. Modern energy management systems can continually expose equipment performance issues that may be hiding in plain sight between extreme weather events. Some RTUs can pass through recurring filter changes and belt tightenings, and still be underperforming. It takes a dedicated system to find those latent problems so that you’re medal-ready when the Polar Vortex Olympics arrive. Fortunately, the drive for excellence is quite pervasive these days. Recent HVAC benchmarking data from the Professional Retail Store Maintenance Association suggests that the majority of retail chains have adopted some type of on-site energy management system. The rate of adoption of such systems is lower in other industries (such as restaurant chains, convenience stores, and financial services), but growing rapidly. 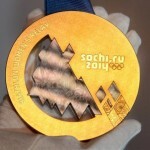 In the Olympics, the difference between gold and last place can be a few milliseconds. Similarly, the difference between a good year and a bad one for some types of businesses may only be a week of sales that were lost to bad weather. The good news is that unlike the Olympics, there is no reason why all HVAC fleet managers can’t ultimately win the gold. It just takes preparation, skill, and determination. Learn more best practices for choosing and optimizing an energy management system for small-box retail and restaurants: Watch a webinar we hosted featuring experts from Ecova.